I’m feeling pretty wretched right now, but I’m really happy to know that this is the last round I’m going through, and the last time I’ll be on the downward slope of this roller coaster. I know it’ll be a while until I feel myself again, and a longer while until I’m back to 100% – but emotionally it feels good to know that slow climb will begin soon. A few weeks, soon. That is all. I hope y’all are doing well, and thanks for all the kind words in the past couple of days! Last Friday, I had a CT scan and X-Ray for the first time since the chemotherapy started. I’m starting my third (three week) course today, so Friday was the end of my sixth week. This morning, I met with my oncologist to discuss the results. 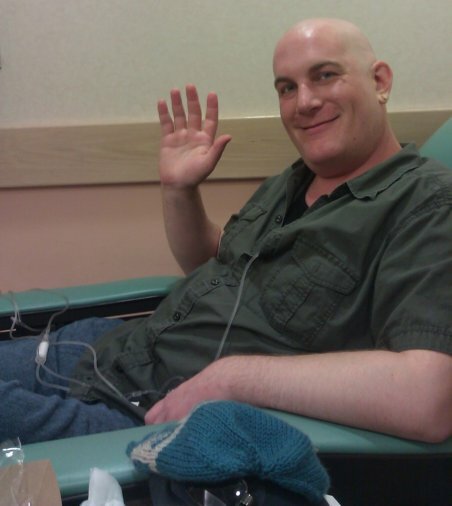 The largest tumors I have originally started out at 5cm, which put me right on the line between stage 2 and stage 3 – and the hope was that they’d have shrunk to 3cm or below by now. As the doc told me a couple of weeks ago, if they were still 3cm or larger, we’d need to start talking about other options (i.e., more chemo and/or surgery). If they got to below 3cm, it meant I was responding well to the therapy. So, that is the metric – 3cm. Note to self: don’t run out of anti-nausea pills. Just a quick update here. I’m in the chair – been here for about an hour and a half. On day one, I was feeling pretty good through the day until the nausea hit a little bit around 6:30pm. Not too bad, but definitely off. Low grade headache. Energy vacillating between low and high, thanks to the steroids + exhaustion. On day two, I started feeling off pretty much as soon as I got home from chemo. Headache is still ever-present, but still not very bad. I feel a little like I had a vaccine shot yesterday or something – you know how it feels a little like a low grade cold? Today is day three – I woke up feeling kind of crappy, and really just wanted to crawl back in to bed. I still wouldn’t call this “bad” by any stretch, but my energy is absolutely down and I’m feeling weird. My hands were shaking mildly this morning. I’m eating, though less than usual. This morning I had a bowl of instant oatmeal – 2 packets. The first two or three bites tasted good, but after that I had to make myself eat the rest. I got it down okay – I didn’t have to “choke it down” or anything – but I really didn’t feel motivated to take any more bites either. Meh – more later. Rest now.